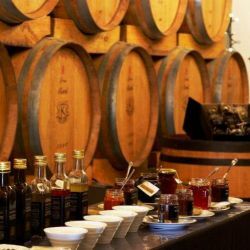 Wine and Wineries / Wine Farm related culinary experiences. 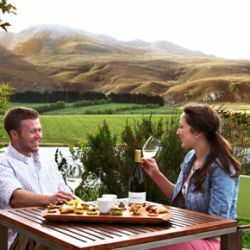 Join us for delicious food, award-winning wines and great entertainment in the tranquil surroundings of our winery. Imagine an irresistible starter of blue cheese, pear and ostrich carpaccio followed by a delectable, traditional main meal of bobotie, pumpkin fritters and sambals. Then, if you still have room, how about a mouth-watering sago pudding or a gorgeous slice of carrot cake? Children are welcome; the outside area provides a spacious, safe playground with a jungle gym and water worm. Inside play area also available. Our exciting Sunday menu changes every week. Find out on our Facebook page what delicious fare is on offer. This is a beautiful family story of vine to wine made in harmony with the family credo of faith, hope and love. The Bosman family have been grafting vines on their historic farm Lelienfontein since 1888. Their vine nursery is regarded as one of the leading vine nurseries on the African continent giving the wine making team at Bosman a selection of 47 grape varieties to make wine from - a position rivalled by few wineries in the world.Their consistent efforts in social and environmental responsibility were rewarded in 2012 when they received the IWC Fairtrade Trophy.In 2012, De Bos Handpicked Vineyards was launched as the premium Fairtrade range produced by Bosman Family Vineyards. Wines are handcrafted from selected vineyards from the estates owned and managed Bosman Family Vineyards. These vineyards are found in Wellington, Hermon and Walker Bay. At Creation wines in the heart of the beautiful Hemel-en-Aarde Ridge a warm welcome awaits young and old. Visit us this summer to experience out little piece of paradise and discover a wine destination with a unique difference. 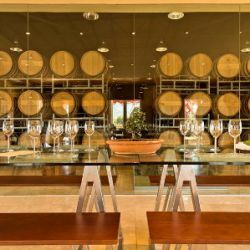 Informative vineyard and cellar tours, relaxed wine tasting and innovative food and wine pairing are but a few of the highlights, while a host of fun activities keeps the little ones entertained. Among the many other attractions are our exquisite Fynbos Garden, our exciting collection of contemporary art and our scrumptious antipasto platters. Our chef has recently expanded his delectable repertoire and a special kiddies' menu caters for tiny tots. Delaire Graff Estate has achieved what owner and globally renowned visionary Laurence Graff had in mind when he acquired this magnificent Cape Winelands property in 2003 and vowed to transform it into South Africa’s most desirable art, hospitality and wine destination. 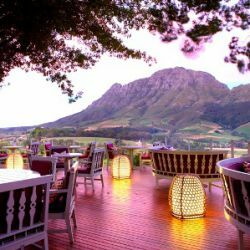 Today, with two outstanding restaurants, a state-of-the-art winery, exclusive Lodges, a destination Spa and two luxury boutiques, the transformation of this piece of paradise, nestled between majestic mountains and overlooking the vineyards of Stellenbosch, one of the world’s leading wine destinations, is now complete. Executive Chef Christiaan Campbell offers his signature style ‘bistro-chic’ cuisine at the Delaire Graff Restaurant.Campbell has elevated dining at Delaire to an art form. 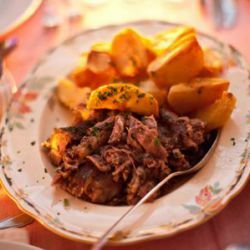 Beautifully presented dishes use the highest quality seasonal ingredients from ethical farmers and organic suppliers, while desserts are a triumph of indulgence and originality. Excelsior Estate was founded in 1859 and has been in the De Wet family for 5 generations. It is now owned by Freddie and his son Peter, and they are ably assisted by their wine maker Johan Stemmet and a dedicated team. Excelsior has over 220 hectares of vineyards planted to only noble varieties, including Cabernet Sauvignon, Shiraz, Merlot, Petit Verdot, Sauvignon Blanc and Chardonnay.&nbsp; All vines are planted on the calcareous clay soils that make the wines of the Robertson region so special. It is our philosophy that great wine is made in the vineyards and perfected in the cellar. 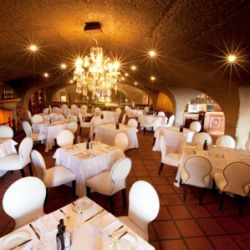 Nestled into the side of the Franschhoek Mountain,the iconic Haute Cabriere Restaurant is renowned for its unique location. Soaring arches frame the picture perfect view over the cathedral-like Pinot Noir Barrel Maturation Cellar below which offers a superlative wine tasting experience.On sunny days, guests can enjoy the beautiful vistas from the terrace whilst on cool days a roaring fire beckons.Chef Ryan Shell's menu revolves around seasonal availability of produce.A selection of full- and half portions, as well as the Delicious Little Things menu encourage guests to relax and sample a variety of enticing pairings.A selection of tasting menus offer a wonderful journey through their wine and food offering.The flavours and textures on the plate are specifically designed to complement the range of Haute Cabriere wines and Pierre Jourdan Cap Classiques, Bringing all of these elements together, Haute Cabriere offers the complete marriage of food and wine. For the past 300 years Kloovenburg has harnessed the rich agricultural potential of the Swartland’s soil.Today, under the leadership of formidable husband-and-wife team Pieter and Annalene du Toit, Kloovenburg stands proud as a top-end wine producer and olive grower of international acclaim.Du Toit’s philosophy on winemaking is that ‘Success depends equally on the suitability of terroir and the skill of the winemaker.’At Kloovenburg, skill and terroir are well matched to produce wines of excellence.Kloovenburg’s entry into the olive industry is marked by passion and chance.Annalene's tapenades, olive jams, bottled olives, and olive oils are now in demand by leading up-market retail outlets countrywide.However, its Kloovenburg’s extra virgin olive oil that truly showcases Annalene’s expertise. 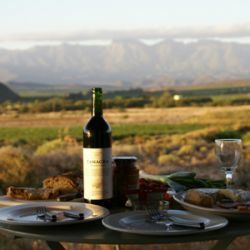 Morgenster Wine and Olive Estate in Somerset West, 35 minutes from Cape Town, is at the gateway to the Western Cape wine-growing region. It is a thriving olive and wine farm dating back to 1711, producing internationally acclaimed Bordeaux-style wines and extra virgin olive oil of astounding quality. 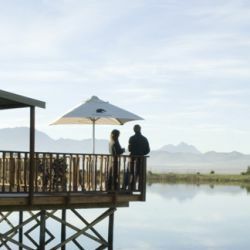 Visitors to the Estate's stylish Revel Fox designed tasting room,which is set against the Schaapenberg and overlooks a reed lined dam and the Helderberg, can enjoy a wine tasting experience unique in South Africa. The Estate's philosophy is to release its red Bordeaux style blends only when they have developed and aged to potential and the cellar therefore houses highly awarded earlier vintages under its Morgenster and Lourens River Valley labels. Visitors can also enjoy Giulio Bertrand's three Italian Collection wines from his small sangiovese and nebbiolo vineyards and be guided through an olive oil tasting of intriguing complexity. Unfamiliar with the word " locavore" ? 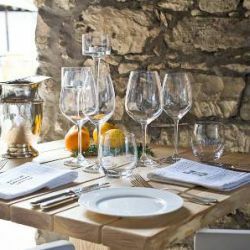 Then visit Springfontein Eats where Jurgen and Susanne, managing restaurants in some of the world's top locations, have opened their restaurant. Fresh herbs, vegetables and fruits grown or foraged from the farm. 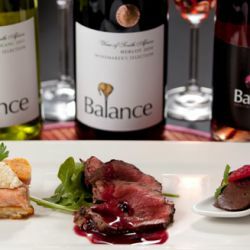 Savour flavour - treats like sweet potato mousse with wood-sorrel foam, box of oxtail stuffed with mushrooms, berries and basil, and and and... Michelin starred in Germany since 1998.Huge winelist with SA wines, German Riesling and from Bordeaux. Opening HoursBy appointment or visitors are always welcome when the gate is open! At Tanagra Robert and Anette Rosenbach produce an exclusive range of handcrafted wines and spirits. Our winery , a member of the Biodiversity and Wine Initiative (BWI) focuses on single vineyard wines typical for the fynbos-scented terroir of this part of the Klein Karoo. In our distillery we use German technology and know-how and local fresh products of the highest quality to produce a range of stylish Marc (or what the Italians call ‘Grappa’) and Eau de Vie in very limited quantities. Visitors are welcome to come and visit us at our farm for a personal wine-/grappa tasting. Please feel welcome to pop in if the gate is open, or alternatively please call us ahead to make sure that we are around. 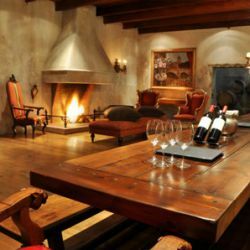 You can also stay in one of our farm cottages and spend more time at our farm, walk the vineyards and explore the winery and distillery in more leisure. Opening Hours12h00 - 14h30 Lunch Only / Closed Mon and Tues Bookings essential! On Sundays you can expect a delectable Country Feast - artisan breads, from organic stoneground flour or special spelt-flour breads. Pickled vegetable salads, home-made cured meats or something smoked. A wintery flavoursome soup or a smoked haddock soufflé.Slow roast Lamb, sticky Beef short-ribs, slow braised Pork cheeks, Chicken and wild-mushroom casserole, traditional Cassoulet, Aubergine bake, Truffle gratinated Cauliflower, Duck-fat roast potatoes, heirloom veggies, or something from the organic vegetable garden.Dark Valrhona Truffle tart with salted caramel, preserved quince’s and Tonka bean cream, or making use of their 100 year old fig tree’s harvest in their special Frangipani tartlet.Enjoy a seasonal monthly menu during the week.Their food philosophy is to use and serve as much free-range, organic and local ingredients as possible, and they are big supporters of nose-to-tail eating. They recycle everything, as part of their mission to reduce their carbon footprint. Opening HoursLunch Wed - Sun 12h00 - 14h00 Dinner Wed - Sat 19h00 - 21h00 Please note the restaurant and tasting lounge will be closed for their annual break as of 16 June 2014 and reopen on Wednesday, 16 July 2014. Conservation-minded Waterkloof unlocks nature’s true potential with wines of great complexity and uncompromised quality, each embracing a strong core of elegance and integrity. The wines are shaped by an amphitheatre of bio-dynamic vineyards,with each cellar gem defined by a unique character and sense of place.Waterkloof Estate’s signature‘restaurant in the sky’ is gorgeously appointed in a 10 metre high glass promontory flowing from the slick tasting lounge and gravitational cellar, where contemporary classics marry elegant wines for an elevated food and wine experience. Here food is art,calling for unhurried appreciation and complemented by seamless service. 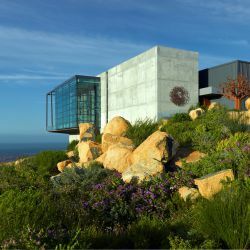 Chef Grégory Czarnecki, draws inspiration from the restaurant’s spectacular setting, perched high on the slopes of the Schapenberg with an eagle’s view over False Bay. 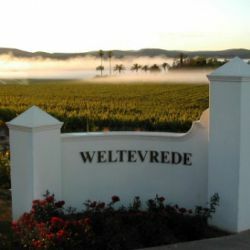 Weltevrede is a family owned and managed Wine Estate in the Robertson Wine Valley, close to the town of Bonnievale. Over four generations the Jonker Family Wine Estate has become known for inspiring wines, nurtured to express the qualities of unique terroir.The underground cellar at Weltevrede consists of old cement tanks that was used in the 1930’s for wine storage. In 2003 we broke through most of the walls to create a old world feel venue that is perfect for the storage of Cap Classique and also creates the atmosphere for an unforgettable wine tasting experience. For only R100.00 per person, come and enjoy a unique tasting experience.